"A lovely, fresh blueberry syrup with mellow vanilla undertones." Combine sugar and cornstarch in a large pot. Pour in water, corn syrup, and lemon juice. Stir in blueberries and vanilla bean. Bring to a boil, reduce heat, and simmer until thickened and infused with vanilla flavor, about 5 minutes. Remove syrup from heat. Strain syrup into 3 hot, sterilized half-pint canning jars, filling to within 1/4 inch of the top. 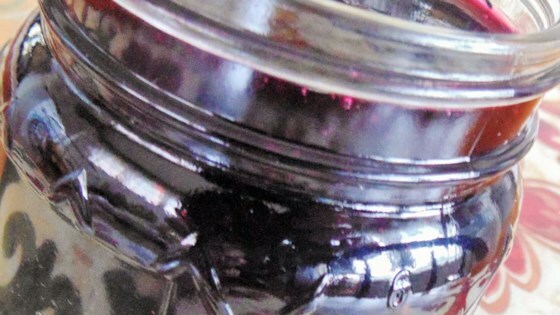 Wipe the rims of the jars with a moist paper towel to remove any residue. Top with lids and screw on rings. Remove the jars from the stockpot and place onto a cloth-covered or wood surface, several inches apart, until cool, about 1 hour. Press the top of each lid with a finger, ensuring that the seal is tight (lid does not move up or down at all). Store in a cool, dark area. This syrup came out perfectly. The vanilla added a very nice flavor. I've also substituted strawberries for the blueberries. Both syrups were a hit with family and friends. Not too sweet, which I really liked. Easy to make. I would just like to use something other than Karo syrup, but otherwise a great recipe.